Not Ready for Mr. Right or Miss Right. How about Mr. or Miss Right Now? We need to make our clients feel that is is cool to use a computer dating service for lining up dates for proms, dance school events. To accomplish this we will select some of the most popular students at school, offer them a significantly reduced rate for our service, We should rent them tuxedos, arrange for limosines, corsages and let them show the others that our service is for everyone. The questionnaire is an on-line questionnaire.Dating Survey When the person is finished with the survey, they press the Send button and the completed questionaire will be sent to our company's e-mail address. When a significant number of surveys are received, the IT Department staff will merge them together to create a file that will be read and interpreted by the Lovebytes software. The program elements are accessed by clicking on the appropriate tab. A list of all clients can be viewed, Individual records can be displayed, matches can be found and dating profiles can be generated. The only tab that is not password protected is the view individuals records. We want prospective customers to view our data base. A profile will then be generated from the software to give our clients profiles on their Date Potential, Personality, Job/Career Interests, Character and Family Values. The results of the matches, the profile and a picture of each match will be emailed to the client. In addition to the regular monthly dating packages, we offer special open house and trade show packages consisting of the following items to make the computer dating experience even more special. The target market for most computer dating companies is twofold: the 20 to 35 year old segment and the 36 to 60's segment. Incomes in the younger segment range from $35,000 to $85,000. Fifty-three percent have some college education. Twenty-three percent have graduate degrees. They enjoy spending time with friends. They have a difficult time meeting single, interesting people. They want to avoid bars and nightclubs looking for a date. There is a nine percent growth rate projected for this segment. The income range for the older segment is between $55,000 to $100,000. Sixty-five percent have college degrees. Forty-one percent have been married before. They have trouble finding others their own age to date. They have tried many different methods to find a partner. An eleven percent growth rate is expected for this segment. These companies focus on life-long partners with the end result of marriage. Our target market segment is quite well defined. It consists of high-school aged and college-aged students, single, with a fair amount of discretionary income earned from part-time jobs. The money earned is theirs to keep and does not have to be spent on food, rent, utilities etc. They spend their money on music, entertainment, clothing, etc,. They are very busy with school, sports, extra curricular activities and work and are in need of our services to find dates for school activities as well as regular dates. They are not interested in life-long partners at this stage in their lives. They are looking for dates with good physical characteristics and people with the similar values and interests. Our company will attempt to debunk the myth that younger people should have no problem meeting people. We want to convince our tarket market segment, that it is a cool thing to try computer dating, not a last resort. Currently we will focus on students in California and will later expand our market to include Virtual Enterprise companies in Oregon, Hawaii, New York, Virginia and the Carolinas. The matchmaking industry had been fairly stagnant for a number of years, but within the last three years, with the proliferation of on-line dating services, the entire industry has been rejuvinated. More and more people are turning to on-line dating. The on-line movement has helped legitimize the entire industry. There are 40 million users with 1.9 billion dollars in revenue generated each year. The on-line services moved the paper and pencil model to reach a new audience. 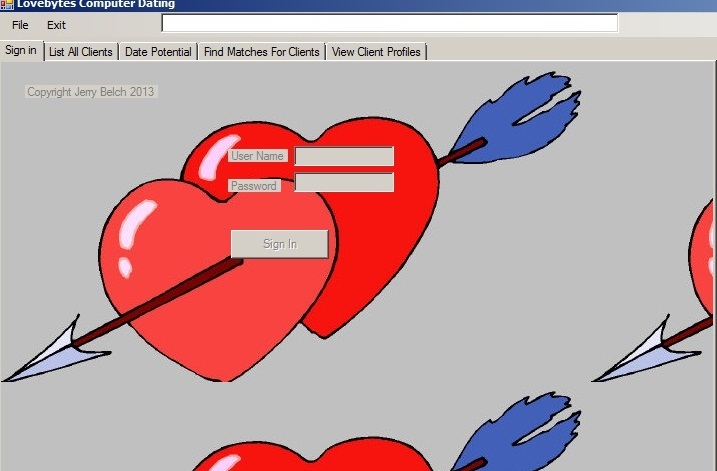 The market is composed of a number of types of dating services: Online where questionnaires are completed on-line and a computer program is used to find the matches and create profiles of the respondents., <Newspaper-based personals are another form of dating service, where people write a little about themselves and/or who they are looking for and people respond accordingly. Then there are the traditional matchmaking services that do not use a computer but calculate the matches by hand. Some interesting facts about the dating market are that 81% lie about their height, weight and age in their profiles. The average couple who meet, wait 18.5 months to marry. Those who do not meet on-line wait 42 months before getting married. Almost one half of men and women "Google" their date before meeting them. People with Internet connections were much more likely to be in a relationship, 72% then those without 46%. Heterosexual couples who met on-line, rose for 0% to 20% from mid 1990's to 2010. The mobile dating market is expected to be worth 2.3 billion dollars by 2016. Twenty one percent of couples meet on social networking sites. There are 1500 dating sites in the United States Seventy seven percent of Americans reported going on two or more dates this past year Revenue from on-line dating grew 3.5% from 2007 to 2012 Out of the 55 million singles in the U.S., 5.5 million use a dating service. Sixty four percent of on-line daters say that common interests are the most important factor in finding a partner. Fourty nine percent say that it is physical characteristics. Some of the major players in the dating market are E-Harmony. They compare 29 dimensions of compatiability with the goal of creating long-lasting relationships. They have a free version with limited functionality. They have a basic plan and an advanced one. Perfect Match is another major competitor in the dating services market. They use advice columns snd articles, conduct single events in the area and send ice-breakers to prospective dates. Their questionnaire examines impulsivity, personal energy, outlook predicatability, flexibility and decision making abilities, Chemistry.com matches singles by chemistry or underlying attraction. Match.com is another significant player in the dating services market. One strength in our business plan as far as the industry analysis is concerned, is that we are an on-line competitor which makes us appear scientific in our match making. Another strength is that our target market is very specific and aimed at high school aged and college aged students. Most other dating services focus on other market segments. There will always be others that want to tap our market as soon as they see how successful we are. Another threat comes from the ever-changing technology. With the proliferation of tablets, smart phones, etc. we will need to develop a programming format thet runs on thos platforms. Compare company vision and experience against averages of similar operations.